Fans of 1970's pop music will remember "Only Yesterday" by The Carpenters, one of the best selling artists of all time. Karen and Richard Carpenter had a distinctively soft musical style with incredibly warm vocals and wonderful piano artistry. 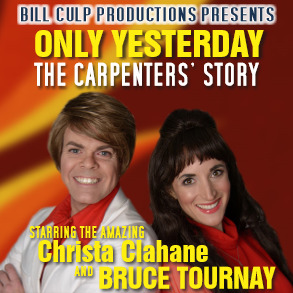 Come out and relive the music of The Carpenters with amazing costumes and dynamic onstage performances by Bruce Tournay and Heather Christine singing "We've Only Just Begun", "Rainy Days and Mondays", "Top of the World" and many more! Get your tickets today!